At 71 years-old, Mr. Hammond looks forward to his twilight years by indulging his gardening addiction. While most people his age are pushing around walkers or leaning on canes, Mr. Hammond can be found behind a tiller or maneuvering a weed whacker through his impressive garden. It’s an appropriate hobby for a man who’s self-sufficient, strong and independent. It’s also why he’s alive. When the catastrophic failure of the Federal Levee System flooded New Orleans, Mr. Hammond did what thousands of his New Orleans neighbors did – he climbed into his attic. While the putrid water inched its way into the rafters and the oppressive summer heat suffocated the attic air, Mr. Hammond contemplated a solitary and tragic death. His days and nights were spent scrambling through a dark and acrid crawlspace warding off the swamp critters attempting to preserve their own lives. He could hear the Coast Guard helicopters picking neighbors off their roofs and delivering them to safety or at least a different kind of torment at The Superdome or The Convention Center. He knew they couldn’t see him. He knew they couldn’t help. He knew this might be how he died. Instead of slinking into a wet corner and accepting a quiet water-logged grave, Mr. Hammond started to work. He harnessed his independence, cultivated through 35 years commercial truck driving, and started to pick. His bloodied and wrinkled hands chipped away through the wood, plaster, nails and wiring. Eventually, through scorching days and sleepless nights he created a hole large enough to pull his slender body through. The house he saved for his whole life – the house that represented thousands of miles of America’s highways and hours of sleepless overtime – was not going to be his coffin. A fellow New Orleanian heard his desperate cries and rescued him in a boat, thus beginning his real Katrina odyssey. He eventually made it to the Super Dome and then to Texas. 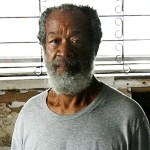 Earnest Hammond never debated whether he was coming back to New Orleans after Katrina. You don’t give your heart and soul to a city, raise your family in it, and build a modest but comfortable existence in it and abandon it when it gets a little wet. Instead, Mr. Hammond did what he always did; he went to work. He traded the solitary days and nights in an oppressive attic for the backbreaking solitude of gutting his water-logged possessions. When his home was cleared and still camping in his mildewed living room, he went searching for a loan. Quickly finding out that there are few banks willing to loan money to an old man with no credit history (Mr. Hammond always paid cash), the offers of assistance for a FEMA trailer were greatly appreciated. FEMA was a tragic lifeline, eventually giving him a cramped trailer. The Louisiana Road Home was billed as a savior for the thousands of affected homeowners whose insurance was inadequate in supplying the necessary cash to rebuild. Mountains of paperwork, endless interviews and months and years of waiting eventually heralded a final decision: Denied. A bureaucratic enigma made Mr. Hammond ineligible for a Road Home Grant. His appeals were repeatedly denied and it appeared that if his house was going to be rebuilt, he would have to do it alone. He knew he wouldn’t get a job driving trucks again because of his age. He knew he wouldn’t get a loan. He knew he had to do something, anything to get back home. Instead of throwing his hands in the air, he looked at the aluminum cans scattered on the streets of New Orleans. Mr. Hammond was going to rebuild his house by picking up one discarded beer can at a time. His plan was to trade aluminum for drywall. 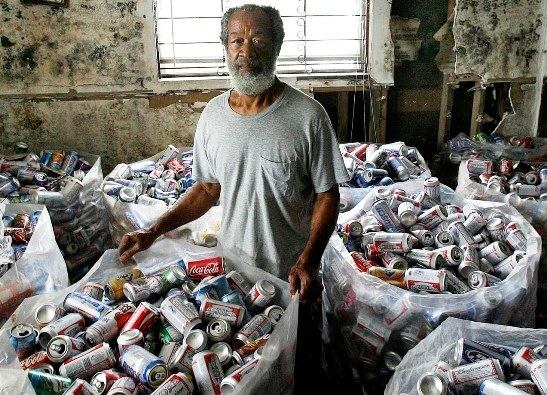 When staff from the Abandoned Building Project encountered Mr. Hammond, he had several thousand cans stashed in his gutted house. Outreach quickly linked Mr. Hammond with the Episcopal Rebuilding Initiative who used volunteers to rebuild this man’s little slice of New Orleans. There was never any debate whether Mr. Hammond would be back.